This past week I had a new patient seeking advice on what supplements she should be taking to support her bone health, along with the health of her eyes and her immune system, and aid in preventing urinary tract infections. She came carrying a bag with over 20 different supplement bottles and explained why she took each one and the various websites or healthcare professionals who recommended each. 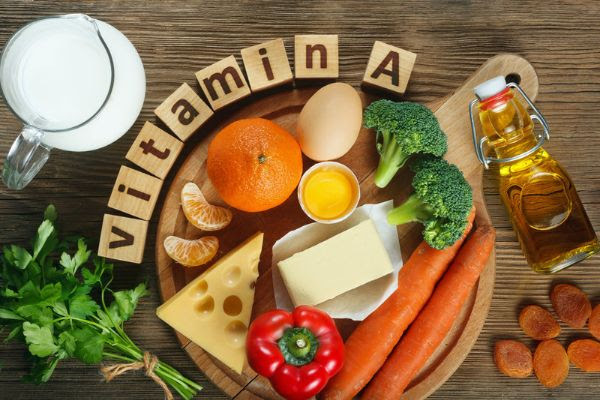 As I read through the label of each supplement keeping a mental calculation of the amounts of vitamins and minerals, I became increasing concerned about the amount of Vitamin A she was consuming on a daily basis. Although Vitamin A is known to benefit eye health, and support the immune system and the bones, excessive amounts may actually contribute to osteoporosis. Although the research is mixed, more studies than not suggest that consuming too much vitamin A may increase the risk of bone fractures. The latest animal study published in the Journal of Endocrinology, October 2018, concluded that consuming too much vitamin A may decrease bone thickness, leading to weak and fracture prone bones. Our body cannot make vitamin A, so it is essential that we get it from our diet. Vitamin A is a fat-soluble vitamin, meaning that it needs dietary fat in order for it to be absorbed and then is stored in the body’s own adipose tissue. Therefore, if you take in more vitamin A than you need, it will slowly build up in your body’s tissues. Preformed vitamin A, also known as retinoids/retinol, is the active form of the vitamin and is available for immediate use in the body upon intake. It comes from animal products such as liver, salmon, eggs, milk, fortified cereals and oils from fish, such as cod liver oil. Provitamin A must be converted to the active form in the body. Beta carotene is the most well-known provitamin A and comes from colorful fruits and vegetables like sweet potatoes, carrots, spinach, cantaloupe. There is less likelihood of excessive buildup of vitamin A when it comes from the conversion of provitamins because, if the body has enough vitamin A, then the beta carotene will not be converted. How much vitamin A do our bones need? Evaluating the research, it appears that vitamin A intake (in the form of retinol) of greater than 5,000 IU a day can be detrimental to bones because it increases osteoclastic activity (the bone cells that break down bone). However, too little vitamin A can halt the development of osteoblasts, the bone-building cells that lay down new bone. In a 4-year study of 958 men and women found that an average daily consumption of 2,000 to 3,000 IU per day (600 to 900 mcg) was associated with the highest bone mineral densities. Aim to eat 3-4 servings of colorful vegetables a day and 2 servings of colorful fruits for healthy carotenes. Avoid large amounts or a daily diet that combines vitamin A-rich foods such as liver, fortified egg substitutes, margarine, dairy products. Avoid supplementing with cod liver oil, since it has very concentrated amounts of vitamin A. Be sure to read your supplement labels, to avoid taking in more than 100% of the vitamin A daily value from all your dietary supplements together. Read labels on frequently eaten foods that may be vitamin A fortified, to determine how much pre-formed vitamin A (retinol) you are getting. Check your skin creams. Some creams used to treat acne, psoriasis and other skin condition contain high doses of vitamin A which can be absorbed through the skin. Vitamin A deficiency is very unusual in the United States and other developed countries. Yet a lack of the vitamin can lead to a higher risk of not only osteoporosis but also increased risk of infection, complications with pregnancy, skin problems and even blindness. Reaching toxic levels of vitamin A are rare unless you are supplementing with it, but be aware of potential vitamin A toxicity symptoms such as vision problems, pain in the bones and joints, lack of appetite, vomiting, hair loss and sensitivity to sunlight. If you are concerned about what supplements you should be taking to build up your bones, give me a call to discuss!